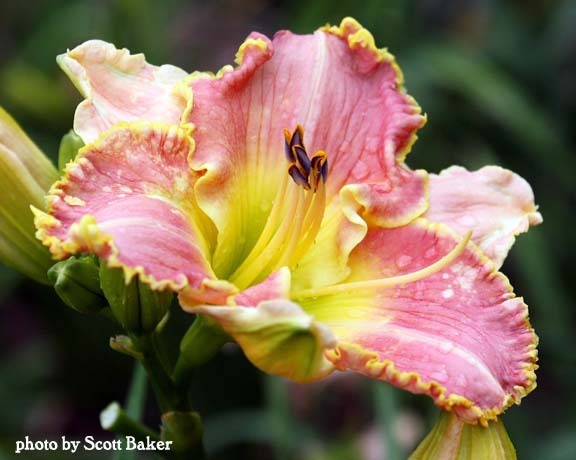 "The modern daylily is as much changed from the original as is a modern car from a curved-dash Olds. 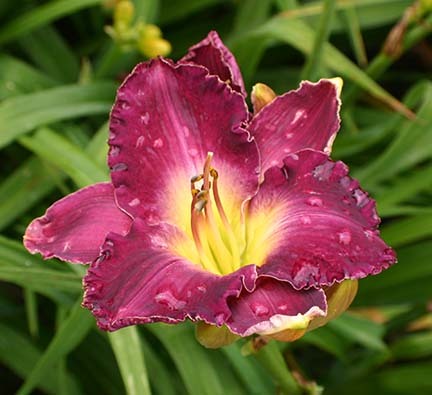 The desirable features of hardiness, variety of colors, vigor and good plant appearance have been retained and improved upon in most of the best new cultivars." "Cultivars which demonstrated poor growth or insufficient blossoming potential for our rugged New Hampshire weather quickly found a new home in our compost heap." Below are some of our favorites for Zone 4 gardens....more pictures will be added as they become available. 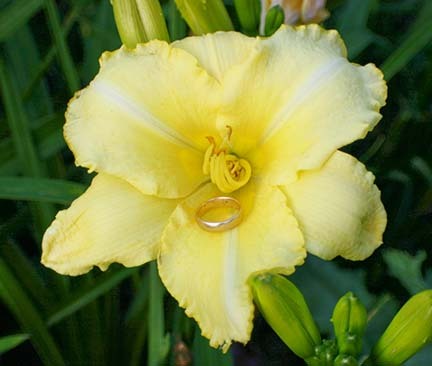 Below is a partial listing of the daylilies that we have on hand as of October,2018. We still have three more beds to inventory, and will add additional names to this list as soon as we know for certain which plants are where! 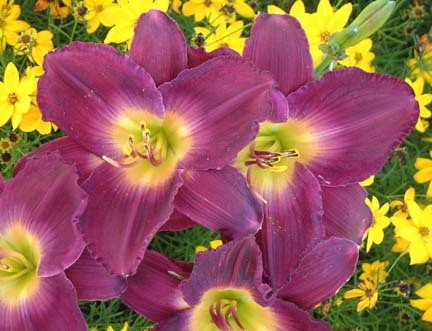 We do dig and ship daylilies. Contact us for availability, or if you have any questions. 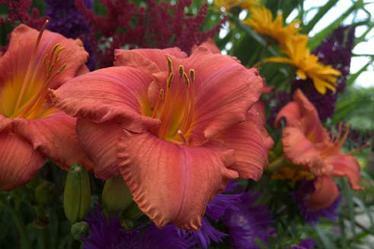 Shipping is $15 for the first two plants, and $3 for each additional plant. Remember, you will get one or more free bonus plants with every order! wedding ring not included...It's a size reference! ...and definitely NOT going out of business, despite rumors otherwise!! 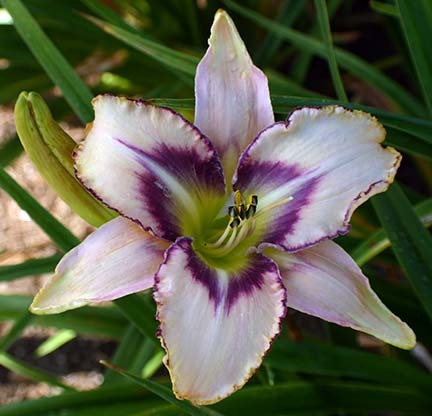 Most of the plants in this list of cultivars can be viewed in our gardens as mature specimen plants in the ground, and are available also as well-rooted, blooming or near-blooming potted plants. 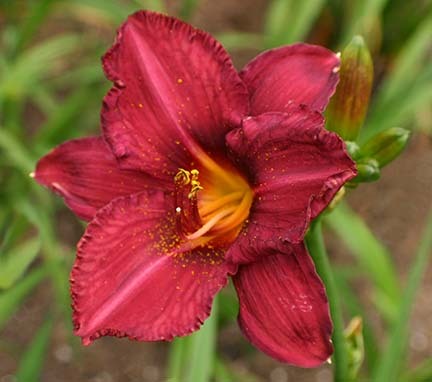 In addition to this list, another 100 cultivars are available as "diggables", as either 2/3 fan starter plants or clumps...sized and priced on the spot. 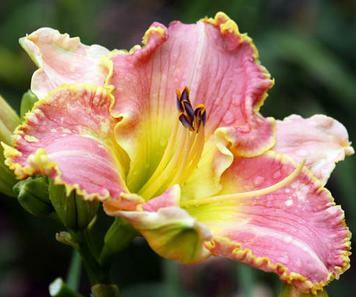 Les also has on hand a selection of potted perennials dug from his gardens which he gives as bonuses on daylily purchases. 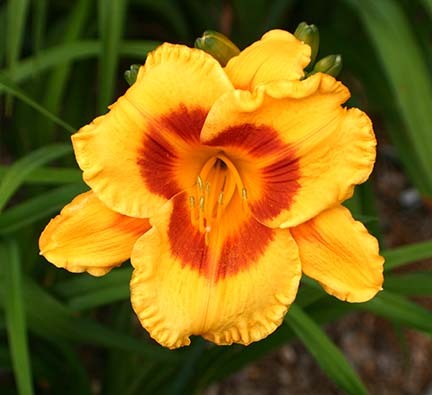 He also often provides free bags of high-quality fresh commercial compost as a supplement to daylily sales. Please note that Sunday afternoons are often VERY busy, and Les suggests that he can provide better service and more freebies/bonuses on Fridays or Saturdays.